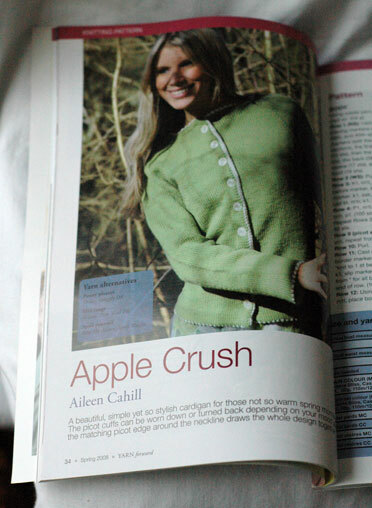 …because I know a lot of knitters are headed to the Electric Picnic this weekend. 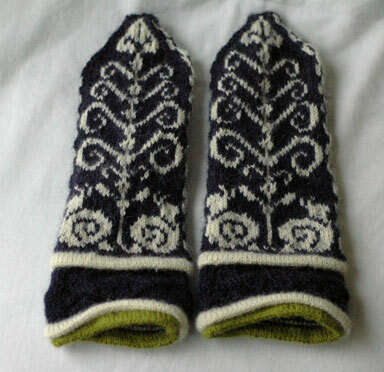 There was even a discussion on Ravelry about wellies. 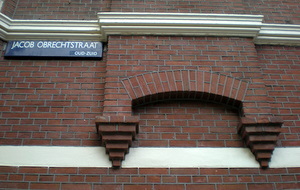 There are lots of things I love about Amsterdam. Van Gogh inspired gardens on the street. Double vowels and amazing 18th century buildings that lean. I kid you not: these guys are built on stilts and lean so much they put wedges between them. My hands are now besnailed. I am particularly fond of the palms and thumbs. 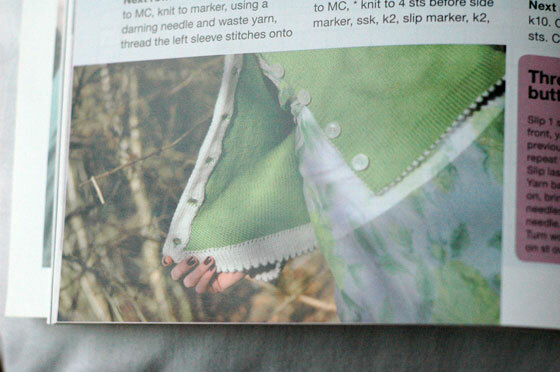 Last night I got stuck into finishing up what is now my favourite garment of all time! 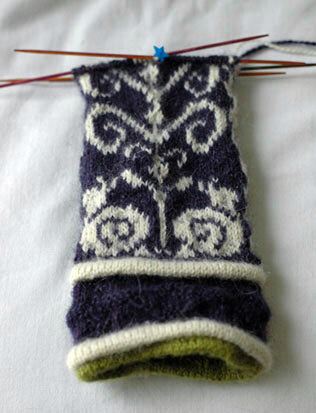 The pattern shall be forthcoming very, very soon and I’m looking forward to sharing lots more photos! Now, if you heard Lisa on RTÉ Radio 1 on Tuesday (listen here! ), you will already know that This is Knit will soon be opening a second branch in the Powerscourt Town Centre in the city centre. If you hadn’t, well… surprise! My own very exciting news on this front is that when I return from galavanting around, I will be joining Lisa and Jacqui full-time. Squee!!! I had snails in Paris once. I was about thirteen at the time and I recall so vividly how they were served in a miniature ceramic bun tray with a two-pronged fork. They reeked of garlic and their texture was that of a large, chewy mushroom. My dad kept bumping the table and saying, look! Did you see that one move? Just a few more ferns to go and the first one will be finished. I was really surprised how quickly it started to move along once I got into it. Thankfully, I’ve never seen elephant on a menu… but I like them just as much. 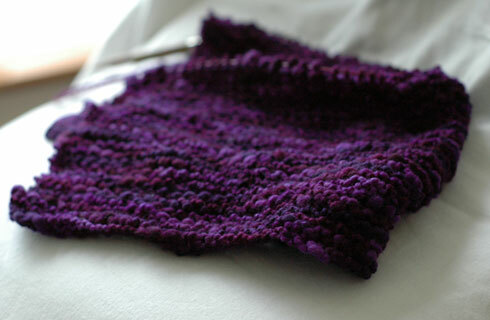 I’m thinking about a little girls cardigan. 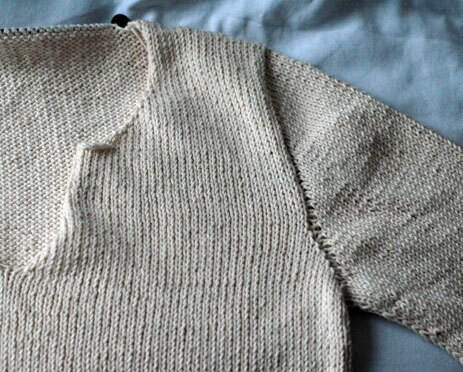 Circular yoke, cream and pink trim. 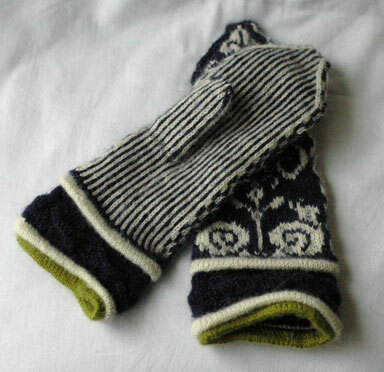 Remember those Yarn Forward patterns I was talking about? 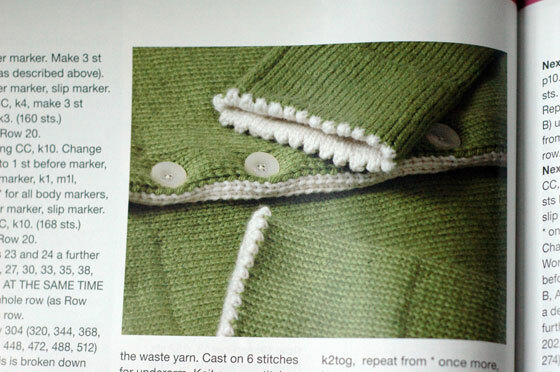 Well, this is the Spring issue cardigan. See more photos from the magazine here, here and here. The Summer issue top ended up looking like this. The photography was a little underlit so I regret not taking better photos myself. I usually finish up these things the night before they have to be sent off, at which point I just want to package them up and not fumble about with a tripod in my pyjamas! Anyway, it’s always nice to see one’s name in print. In case I forget to tell you – I’m going to Thailand next Friday. Going to the States last month was quite a last minute decision whereas going to Thailand has been on the cards for at least a year. I’m going with Alb, thankfully. I’ve had my vaccinations – hepatitis, typhoid, dyphtheria, tetanus, polio – which probably explains why I was feeling a bit off last week. At least I didn’t get typhoid or something. When I got my mumps booster in college, I woke up the following morning with mini-mumps and was completely deaf for two days. There have been a LOT of fibre related activities going on recently. Here’s some of what I spun yesterday and finished off plying today. On the left is some brown fluffy stuff I got from Craftspun at the last Knitting and Stitching Show and on the right is some of the light coopworth I brought to class yesterday. It’s quite ropey but it’ll be nice together in a hat I think. Now, I never blogged about it but Laura gave me some very pretty pencil roving for my birthday and I got stuck into spinning it after breakfast. These are my singles. 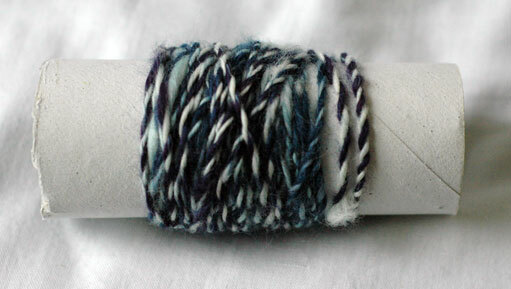 I split the roving in two and spun two batches of two different colours. 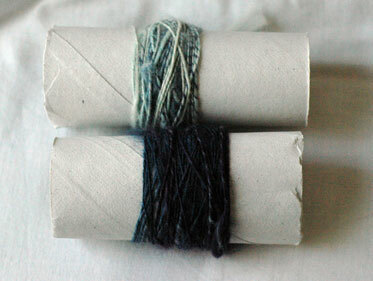 Then, I plied them together so that the colours would have good contrast. There’s not a huge amount there but I was really happy with how I was able to keep the thickness mostly consistent. Yay! Right now I want snails on every thing. Snails and elephants. 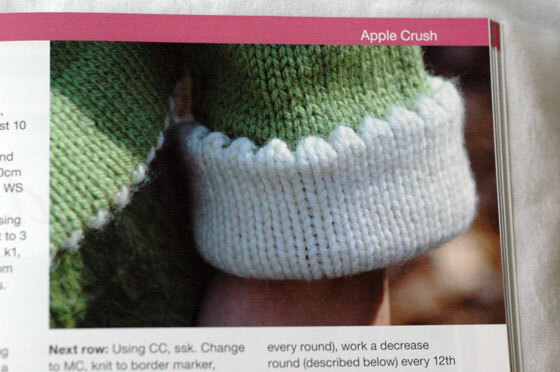 See those green and white bits on the cuff? They are welts. 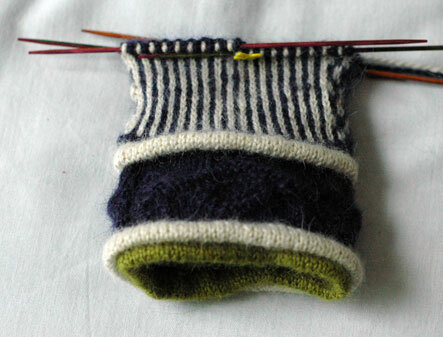 I had never knit one before so now I want welts on everything, too. Snails, elephants and welts. For some reason I can never trust my initial instincts when it comes to sleeve caps. Last night, I struggled through five more sleeve caps before striking as close as I could to perfection for this guy. Sometimes I think that we must work through purgatory whilst living – or something! 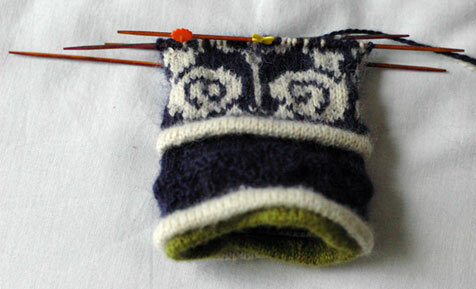 – because reknitting sleeve caps is about as close as I come to writing old Dante a letter re: one’s circles of hell. Anyway, this is the Sampa tunic that I put to one side for reasons unknown. All it needs are two sleeves and a pattern. Last but by no means least, I received this charming little pin in the post a week or so ago. Marian made up some of these crocheted pins for any readers that wanted them. Isn’t that sweet? Mine currently resides on my summer jacket. Marian is one seriously crafty girl! Check out her blog and see what she’s up to these days. Elephants to follow in next post! Today, I took my first class at This is Knit in spinning! 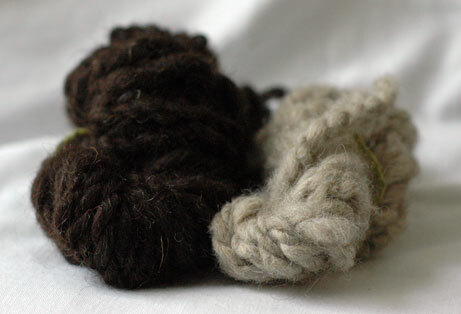 I have dabbled previously and have mysteriously acquired a delicious selection of roving (I think that fibre stash is even more dangerous than yarn stash on the basis that it grows more yarn…), but never had any proper instruction. The class was given by the lovely Diane who was patient, encouraging and was able to help me with my problems with plying. My first problem was that the balls that I wound off kept knotting up together and making an unholy mess. My second problem was that one of my singles is invariably shorter than the other: what does one do with the long tail? Andean ply, of course! I had read all about it but it is one of those odd things that are so obvious when you see it done and is impossible to describe adequately in words. Results to come tomorrow. Yay! Spinning!